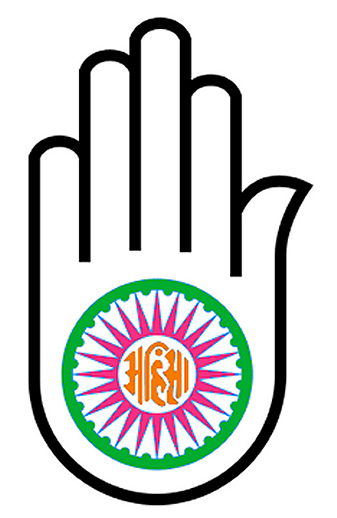 Jain Symbol for the Vow of Ahimsa. Image modified from this source. An ex-friend once told me that when you're overweight and have been eating badly for a while, "You've felt bad for so long that it feels normal." That friend has since undergone a drastic personality change and change in attitude toward friends, which has led us to end our friendship, but the comment above is one of the most valuable things that I will take away from the experience. If you think about my friend's comment from the perspective of Buddhist beliefs, this is how suffering works. We suffer constantly, but we get so accustomed to the suffering that we shift our priorities. We delusionally believe that we can end our suffering by seeking more of what brings us suffering. In dieting, we focus on eating that sugary snack instead of eating something with nutritional value because "bad" becomes the new norm. I've been thinking about these ideas often over the past few days because I have recently started a diet. I am eating simply and eating less. I am trending naturally toward veganism because I have been vegetarian for about 16 years and have developed an intolerance to milk over the last six years. But then I began to wonder what is the Buddhist view of diets and dieting? A strong concept in Buddhism, Hinduism, Jainism and yoga is ahimsa, which is the practice of non-violence or doing no harm. This concept means different things for different religions, but the general consensus is that humans should avoid doing harm to other living beings. Ahimsa relates to our daily actions, including our diets. It's strange, but I see a lot of Buddhists, including myself, who are not living a life of ahimsa. Most Buddhists believe that the point of nutrition is to nourish the body in order to practice the dharma. Along with everything else, practitioners shouldn't get too attached to food or diets because that distracts from focusing on dharma study. Buddhist monks live from alms or food that has been given by locals. Although Tibetan Buddhism generally advocates a vegetarian diet, monks do not have the right to be picky about their food because these monks depend on donations for survival. Monks are permitted to eat meat if it is given as a gift and is not specifically killed for the monks. See http://www.yogichen.org/cw/cw43/bk142.html for more information about the diet of Buddhist monks. Interestingly enough, most of my Buddhist friends are not vegetarian or vegan. Apparently Zen Buddhism and some other forms of Buddhism do not have a prohibition against lay practitioners eating meat, but if a lay practitioner takes vows to adhere to the Five Precepts, then my interpretation of the First Precept of Buddhism is to avoid meat eating. Sure, it says not to kill, but if your purchase and consumption of animal products results in a continuing demand for and continual killing of animals, then aren't eating meat and killing pretty similar? I'm thinking about going vegan. I've been vegetarian for 16 years and take a practical approach to avoiding meat. I generally don't eat meat, but if it's very difficult to determine if some hidden ingredient is meat-based, I'll eat the food if I'm at a restaurant or at a friend's house and then research later to determine whether I will eat the item in the future. Most of the vegans I know take a similar practical approach. My friend Morris, who was the first vegan I ever met, suggested that he didn't think eating honey or beekeeping was that bad because it's not necessary to kill the bees in order to get the product, and he didn't believe that bees suffer as a result of beekeeping. Going vegan will be a slow process for me. It is a process that has naturally been happening over the past year, but I will make more of a conscious effort in the year to come. 1. Eggs rob the offspring's life from the parents, who then suffer. 2. Honey robs food from bees, causing them to suffer. 3. Milk robs the offspring's food and in turn robs food from the mother, causing both mother and offspring to suffer. Honey is a contentious topic and vegans disagree about it. For an excellent essay on this topic, see http://www.compassionatespirit.com/is-honey-vegan.htm. I'm still not sure if honey is really that bad because where honey harvesting in ancient times killed many bees and destroyed the hive, beekeeping today uses artificial hives and only excess honey is taken. Generally in beekeeping, the bees still have a very good quality of life compared to animals used for egg and dairy production and the bees are not intentionally killed in the process of beekeeping. I personally love honey for it's antibacterial properties. Otherwise, I'd probably just substitute agave syrup in everything. In the long run will I be completely vegan forever? Probably not by strict standards. I think being a crazy person about your veg*n diet not only harms you through attachment but harms your message of non-violence by discouraging others from adopting a similar practice. When I eat at friends' houses or restaurants I'll try to avoid animal products, but I won't be crazy about it. I noticed by accident that many of my meals had become vegan at home and at restaurants. I think an important part of a Buddhist diet and Buddhist life is intent. I am going to start eating with more intent, and think that mentally and physically I will reap the benefits of my new diet. Posted as part of Best Posts of the Week, Fitness Friday, Pink Saturday. Interesting read. Thanks for linking up! Very interesting. There are lot of interesting things to leard about buddhism at your blog. Have a wonderful day! Thanks for visiting my blog! Honey is a wonderful food, and I had no idea it had antibacterial properties. Surely if you bought your honey from a local beekeeper, who could object? Food for thought - your post is very interesting - thanks! I love the honey bee also does not suffer and never lose your freedom. Greetings. @Lynn: I think eating eggs from your own chickens at home is the way to go if you're gonna eat eggs. It's so much better than commercial farming and commercial eggs.